From the North: From the A1 motorway, take the exit for Valdichiana then follow directions for Perugia. At Perugia, take the E45 motorway towards Roma/Terni. At the exit for Todi/Orvieto follow signs for Todi. The hotel is about 4 km from the exit. From the South: From the A1 motorway, take the exit for Orte then follow directions for Terni. Take the E45 motorway for Perugia/Cesena. Exit at Todi south and follow the signs for Todi. The hotel is about 1 km from the exit. Coming from North: cTake the train to Perugia-Ponte San Giovanni. From Perugia-Ponte San Giovanni take the train for Terni, stopping at Ponterio. From South: Take the train to Terni. From there take the train to Perugia, stopping at Ponterio. The closest airport is Perugia International “St. 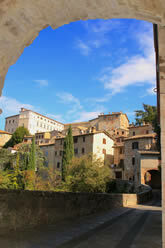 Francis of Assisi” located 40 Km from Todi.